myLSU Portal: How do I Check My E-mail? Students, Faculty, and Staff can check their email directly through OWA LSUMail (mail.lsu.edu). See the E-mail: LSU Overview for more information on email. 2. Click on the Home tab at the top of the screen. 3. 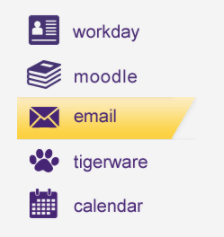 You will see the buttons for Moodle, Email, Tigerware, and Calendar to the left of the page. 4. Click on the email button at the left hand side of the screen. The LSU email login page will open in a new window.